Bennie Rosato meets her twin, Alice Connelly, for dinner and wakes up buried alive. As she struggles to free herself, Alice takes over Bennie's life. Her goal is to take Bennie's money and disappear. While Alice is executing her plan, Bennie escapes the box and goes back to Philadelphia to find her sister and take back her life. Alice has fooled Bennie's employees and ex-boyfriend but with just one day away from success, Bennie wrecks Plan A for Alice. The two find themselves on a race to getting what they want which for both is doing something evil. 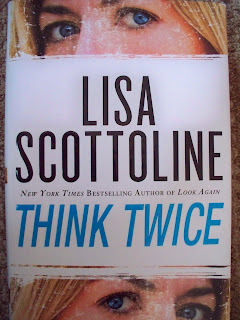 Lisa Scottoline brilliantly writes her characters with an eternal truth at their core which enables the reader to quickly connect with them. They each have profound moments of revelation in commonplace tasks - such as buying a house. The humor, heartache, and tension throughout the book is cleverly interwoven amongst the vying viewpoints of different characters throughout the several day ordeal. Scottoline's pace accelerates with each chapter and the readers will feel their hearts racing by the end. 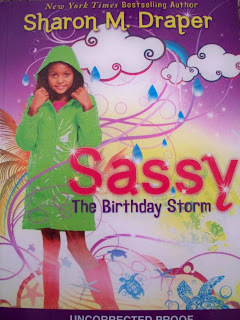 Her word choice and sentence structure well executed which entices the reader to complete this book at a sprint's pace. This book was purchased by myself at a retail chain. It was not given to me for review. I did not receive any compensation from the publisher or author for this review. 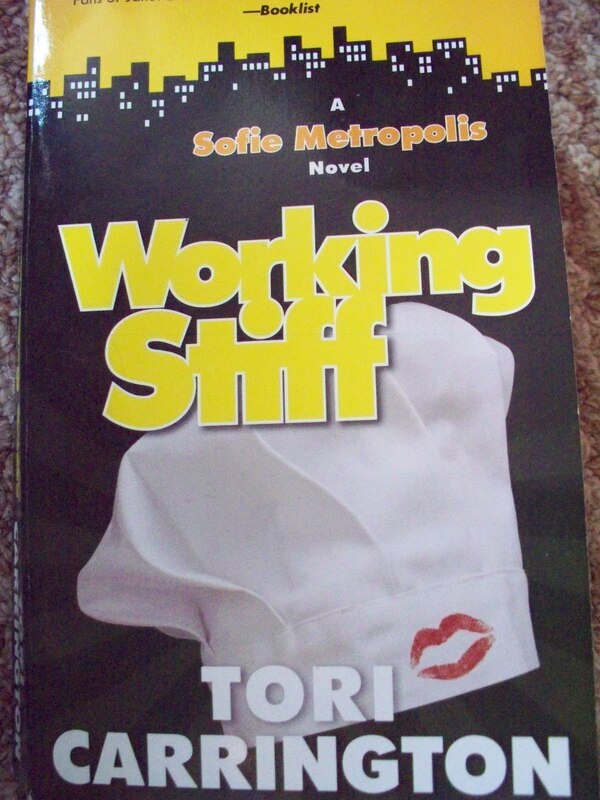 Sofie Metropolis is a private investigator at her Uncle's agency. She currently finds herself looking for a missing body from her aunt's funeral home, trying to prove a murder defendant's innocence, and dealing with the two men in her love life. As the stress from the cases intensify, her love life is thrown into a tizzy partly due to her meddling mother. Sofie doubts her ability as a PI as she goes days without making progress, but soon she stumbles on a bit of advice that changes everything. Tori Carrington's story has humor and a touch of romance. The characters achieve a small personal growth by the end of the book which will endear them to the reader. Carrington discusses old cases Sofie worked, presumably from previous books. At first these are acceptable and relevant, but by the end of the story, they are forced - no longer providing insight for the character's current circumstances. Overall, the story and characters are entertaining, so many readers will look forward to reading more about Sofie and her life. Grace Fisher surprised her fiance, Zack Hoolihan, at an away game and found a woman in his hotel bed. She storms out and will not listen to his claims of innocence. Several months later they are both still agonizing over the broken engagement, when they find themselves in a tenuous situation. Grace moves back in with Zack to temporarily take care of injuries he suffered during a hockey game. Soon the old feelings cause them to revisit old wounds and the truth about the woman in that hotel room. Heidi Betts wrote a story that draws the reader in and emotionally invests them in the characters' relationship. At times, the reader will feel anger at their stubbornness while still maintaining sympathy for their situation. Betts writes characters and situations that are believable and identifiable for her readers. Betts sporadically stumbles over redundancy in her descriptions but these instances are minor enough that most readers won't find them bothersome. The language is direct and moves the story along at a consistent pace. The book is sprinkled with wonderful gems - words that pleasantly wet the logophile's appetite. Readers will look forward to other books from Betts. Peter uses his only florit to get a question answered from a fortuneteller. The answer to the question causes him to doubt his guardian, an old soldier and family friend. Was his sister alive or dead? The fortuneteller told him that the elephant would take him to her. Peter left upset because Baltese had no elephants. Later that day, a magician did a bit of magic that brought Peter what he needed. 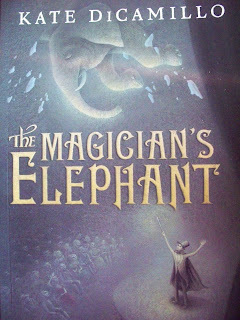 Kate DiCamillo's language is eloquent and pulls the reader back to the time and place when the story occurs. It is a wonderful tale that will remind children of the importance of keeping a promise. The major characters are developed in a manner that allows the reader's imagination to get to know them at their own pace. It is DiCamillo's talent that gives that characters depth without a superfluous word of description. The ending wraps up the question for Peter but readers may walk away without a feeling of closure for other characters. 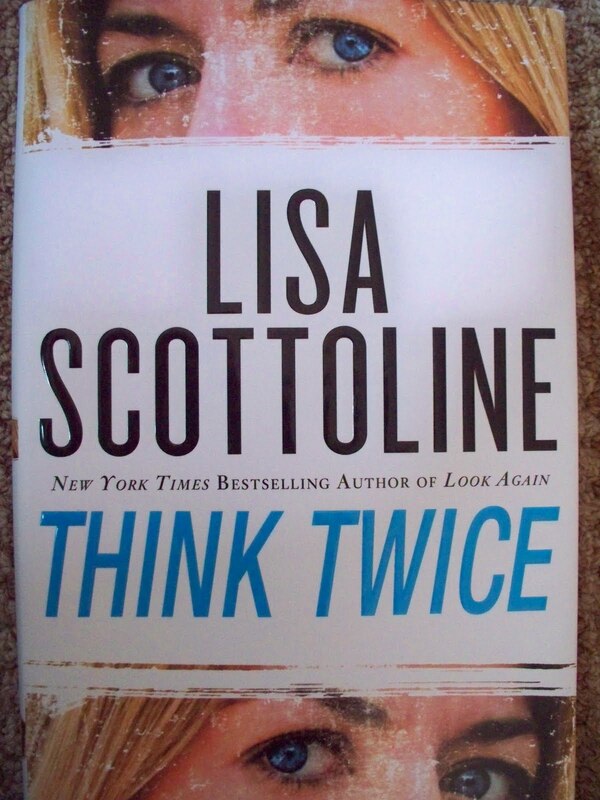 This promotional copy was received during BookExpo America 2009 as a free marketing tool by either the publisher or author and was given to many attendees. It was not given to me to review. I did not receive any compensation from the publisher or author for this review. Lucy Valentine reluctantly steps into the family business, matchmaking, amid her father's scandal. The Valentine family has passed on the gift of seeing auras for generations, but, after an accident as a teenager, Lucy's gift was changed which caused her to previously avoid taking on the tasks of matchmaking. Soon a client sends her in a new direction - finding a lost love. A tangled web of a missing child, murder victim, determined policeman, and insistent reporter envelopes Lucy. She relies on old friends and a private investigator, a potential love interest, to escape. The characters are amusing and the story is lighthearted where appropriate. The action is quick and keeps a reader on a steady pace throughout the book. Being the first in a series, the character introductions and development was sufficient. The author's language is direct and concise allowing the book to be short enough for completion in less than one day. If readers can get past the cheese of the first sentence, they will be pleased with this romantic misadventure. 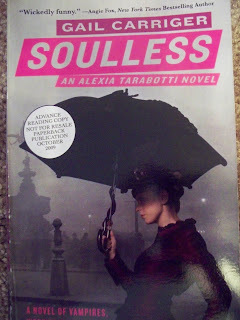 Miss Alexia Tarabotti is a single woman in Victorian England. She is considered a spinster by her mother and half sisters due to her Italian heritage and straightforward personality. It is the later that gets Miss Tarabotti into precarious situations involving vampires and werewolves. Lord Conall Maccon is the Alpha of the London werewolf pack. He continues to cross paths with the heroine during her exploits. Soon the two find themselves at odds with each other while fighting an attraction. Gail Carriger's ability to pull the reader back in time through elegant dialogue and proper mannerisms is fantastic. Carriger beautifully captures the styles of Victorian fashion while spinning this magical tale. The story is captivating and give the reader a new twist to vampires, werewolves, and London society. Readers will find it hard to put the book down before finishing. The next book in this series is entitled Changeless. It will be highly anticipated by readers of Carriger's work. This book was inspired by and titled from a George Eliot quote. It uses this idea as a basis for sharing stories that will encourage readers that they can still achieve. The stories range from changing careers to being creative to finding love. The real-life stories give advice to the reader as well as hope. Not only do the subjects share their stories, they tell about their failures and help show how to begin a journey. The these of each story is there is no such thing as too late, too old, too anything. Regardless of what you are striving toward at this point, BJ Gallagher captures stories you can identify with. The people Gallagher selected for subjects offer a variety of backgrounds that inspire the reader further. With quotes placed throughout the book and quick stories or observations, this collection meshes well and pulls the reader in for an uplifting experience. 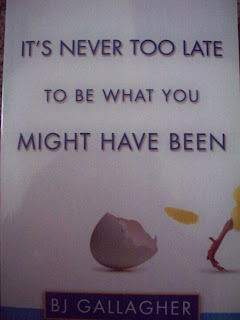 This book is great for anyone having doubts about their choices or the path they should take. I recommend this to everyone and encourage it be sent as a present to others. Vincent is an inventor living with his father, stepmother, and three stepsisters. He works on various toys in his secret lab. When his father gets a new job, Vincent has to leave New York and his lab behind. At his new school, a teacher offers Vincent the chance to enter a toy contest. Vincent enters his windless kite and is chosen to be a finalist. Soon disaster strikes and Vincent has to be quick in finding a solution so he can achieve his dream. 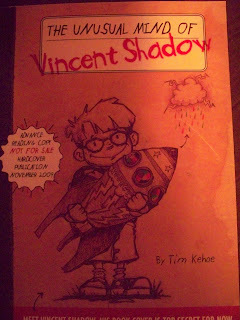 Tim Kehoe wrote a wonderfully imaginative, entertaining, and educating tale of a young boy looking for his place of belonging. Vincent finds it in the owner of a toy company and a famous inventor. Kehoe does an excellent job in meshing these personalities into the story. Vincent is fully developed as an inventor based on the ideas in the book and the glimpse into one of his notebooks at the end of the story. Kehoe has written a story that leaves the reader wanting more. 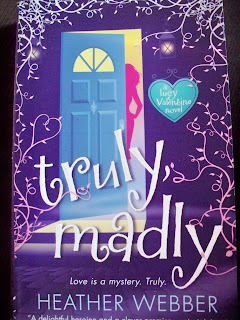 This book was enjoyable even from an adult's perspective. Let's hope we see more of Vincent in the future. Sassy is going to Florida to visit her Grammy and Poppy. It is her Grammy’s birthday and a large party is planned. A hurricane threatens the festivities. Sassy gets scared not only for herself but also a nest of baby turtle eggs. Her family helps to protect the sea turtles from the storm. Sassy’s family works together to get the house ready for the hurricane. They stay close during the storm. Grammy’s birthday party is not what Sassy wanted but she has fun in the end. Sharon M. Draper keeps the reader entertained with the family’s activities during the threat of the storm. Draper is able to relate to the emotions a child would feel during various situations that Sassy faces. Though some elements of the story seemed choppy the overall story was forgiving of these distractions. Wisty and Whit are pulled from their house in the middle of the night by New Order soldiers. They are accused of being a witch and wizard. They deny the allegations while serving time in a detention center. As the situation grows bleaker, this brother and sister realize their powers. Through the help of old and new friends they escape and work to rescue fellow inmates from their death sentences. Soon they learn they are part of prophecies that make them a threat to the New Order. They work to figure out how they can bring down this oppressive government while searching for their parents. James Patterson and Gabrielle Charbonnet entertain the reader with their realistic depiction of a close sibling relationship put to the test. They also horrify readers with the imposing government juggernaut called the New Order. Patterson and Charbonnet change point of view effectively through the book. The story and characters pull us into their world and make us hope for the best. The fast paced book leaves the reader looking for more. An aspiring screenwriter moves to California and finds himself financially crunched. 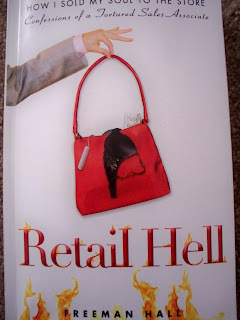 He accepts a job as a commissioned handbag salesman in a luxury department store. Freeman Hall takes us through the horrifying and funny encounters he had nightmares about. Hall devises a category for various customers based on recurring behaviors. Some are rather dramatic. As a true life tale of his adventures, the book entertains. It is a piece of commiseration for those that have suffered through retail jobs. Hall’s characters are at times two dimensional. He fell short of developing his coworkers into identifiable people. His straightforward prose pulls the reader into his world. As a whole this was an enjoyable read. It was threatening to storm the day I met Elena Santangelo at Merrymead Farms. We were closely watching the weather while eating delicious ice cream and discussing her body of work. She has written historical mysteries with modern characters. Being true to the time periods is important to her so she does the research before using her creative side. Though she remains relatively subdued throughout the interview, her passion for and belief in using language of the time to create new characters and events is evident. She wrote her first book, By Blood Possessed, in 1995 and it took four years to get published. It was started because of a dare from her brother. Just as he influenced the start of her career, her parents have influenced the books she wrote, but she is now ready for a new chapter. When asked about her upcoming plans, Elena mentioned wanting to write a book that would encourage girls to be interested in science. She also mentioned that she would like the challenge of writing a children's book. Her writing cannot begin without knowing where things are going. She will listen to hear the narrator's voice in her head. Because she is a fan of language, the color/flavor of her characters come to her before she begins to write. She further develops the language and character as she writes. Elena firmly believes that writers need to work at their words to get it right. Elena gives credit to all the writers she knows for influencing her. Agatha Christie has been the most influential author for her. The great narrative style of Christie's early books spoke to Elena. She recently did a companion book for Christie's short stories entitled Dame Agatha's Shorts. As a mystery writer, her competitors are also friends that she wishes success. As she gives encouragement to others, I wish it for her to meet the level of success she desires. Elena is a creator and wishes that for others. She believes in using imagination to fully develop her music and stories. For more information about Elena and her books visit: http://www.elenasantangelo.com/Books.html. Twin sisters Lia and Alice Milthorpe find themselves at opposing sides of a prophecy that has been foretold for centuries. Lia is slowly introduced to this information after the death of her father. As the mystery unfolds, Lia must determine what roles she plays, who she can trust, and the motivations of her sister in order to prevail. Lia finds herself torn between the temptations of evil, the path of good, and the love she has for her family. She is tested emotionally and physically at every turn. The friends that assist her are in danger as long as they stay close yet can she continue on her quest without them? Michelle Zink cleverly weaves the struggle within Lia into the unveiling of the prophecy. The descriptors pull the reader into Lia's mind and emotions. You find yourself experiencing the same tensions, thoughts, fears; and coming to the same questions and next steps. The internal and external forces that influence Lia carefully play off each other. The transition between these perspectives is flawless. For this I highly complement Zink. 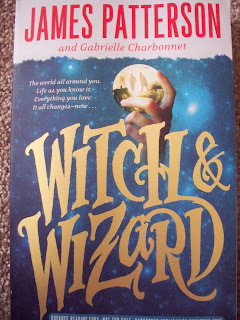 This book is a wonderful combination of character and plot. Readers will find it hard to put down. 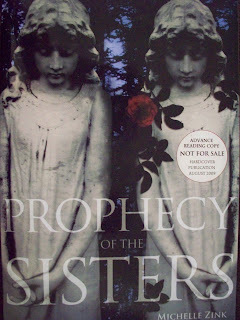 For more information on the book check out the website: www.prophecyofthesisters.com. On a personal note, I cannot wait for Zink's next book.